Breakfast at The Fabulous Baker Boy (hereinafter referred to as Fabulous) wasn’t our original plan for a lazy Sunday. Shereen and I were supposed to go back to Penny University for breakfast and do a thorough review of one of our favourite cafes but guess what? These two hungry cats decided to have TWO breakfasts, first at Penny, and the second serving at Fabulous. It’s easy to find Fabulous -it is at the foot of Fort Canning, a 5 minutess walk away from the public car park at the foot of the hill, or if you are taking public transport, the walkway is near the bus stop. Fabulous has an alfresco setting so seating is outdoors with shelter, and we noticed bamboo blinds installed on the ceiling that are probably used when it gets too sunny. Well, we were lucky to get a table on a Sunday without reservations. In fact, every table had a little hand drawn ‘reserved” tag with the diner’s name on it. Luckily, they could arrange a table for us! Kudos to their great system of arranging reservations and keeping everything in place. Even though we just had a full eggy breakfast at Penny University, we found ourselves in a dilemma as we couldn’t decide which cake to eat! There are about 14 cakes available, and each cake is labeled with a hand drawn tag with cute symbols that let you know what are the main ingredients of the specific cake. I was torn between Caribbean Lemon, Apple Cider, Salted Caramel, and The Ristretto. 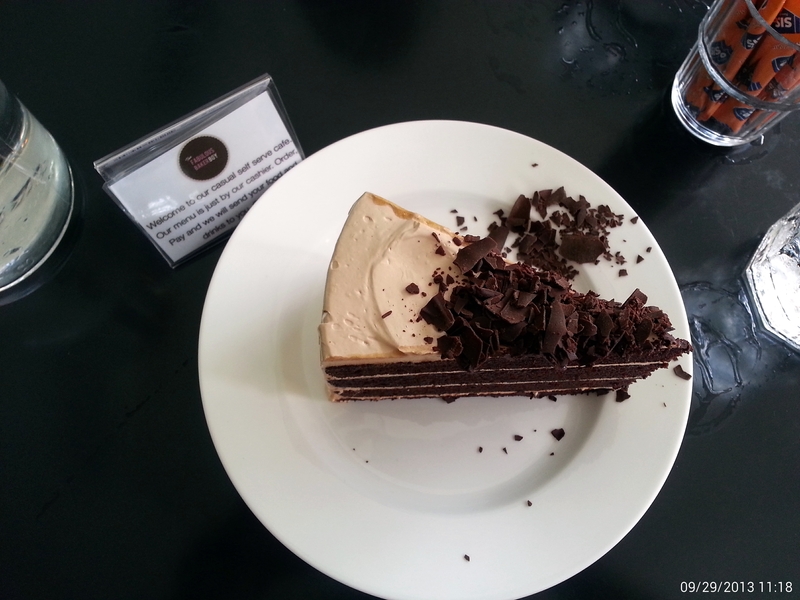 In the end, I decided on The Ristretto (SGD8.50/slice) since it is a combination of the best things in life: decadent chocolate and strong, bold coffee. 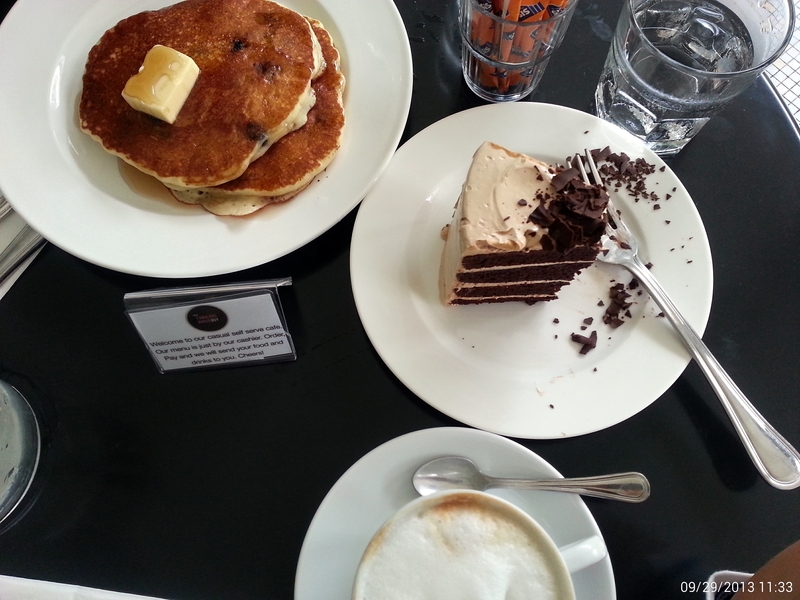 Shereen ordered a blueberry pancake (SGD11.00) and we each had our usual latte (SGD5.40) and cappuccino (SGD5.40). They serve Gryphon Teas so fans of this brand, you are in for a treat. The nice staff behind the counter laughed when she found out this was to be our second breakfast and she said she will try it one day, and she likes how much we enjoy our lives. I always like establishments that aim to connect with their customers. I used to chat with customers while I prepare their coffee when I was working at a coffee chain in my undergrad days. It always makes their coffee experience better. And it is the same for me at Fabulous. It immediately felt friendly and homely for me. We couldn’t believe our eyes when the food was served. Huge slices of blueberry pancakes, and a thick slice of cake. We looked around and marveled at the servings of sausages, pancakes, and eggs fellow breakfast champions were devouring. It is definitely value for money here. The Ristretto is moist, rich and truly decadent. A decadent chocolate cake like this was surprisingly light and not over cloying and it is because the meringue butter cream is light and smooth. I could taste the strong bold coffee, and maybe it was me being overly sensitive, I could taste the vanilla extract and traces of alcohol in the cake. (Well, I am known to be able to smell and taste ingredients in complex dishes). A staff had earlier on informed us that vanilla extract is used and the cake may have traces of alcohol in it. Shereen, the cake monster that she is, was disappointed as she was looking forward to eating the cake, and since the head baker is Hanita Hassim (the sister of Juwanda, the head cook), we thought the cake (and food served) would have been halal. 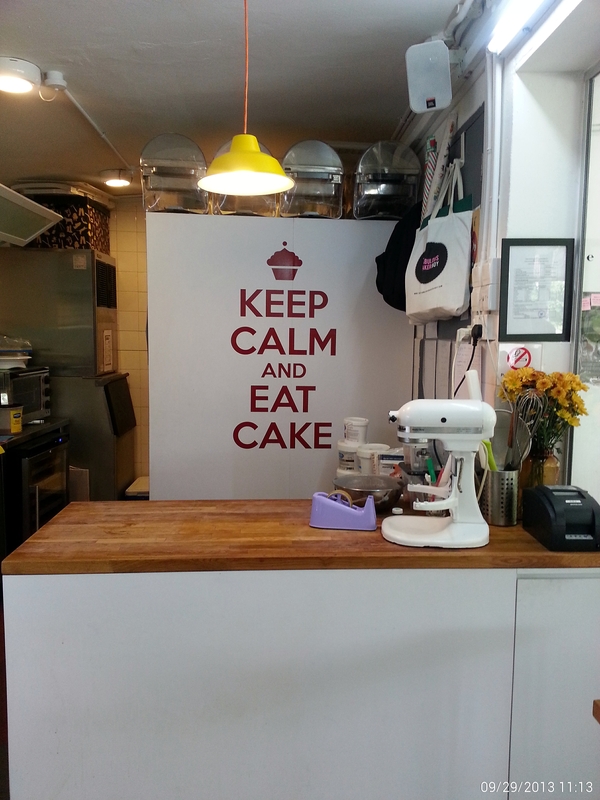 When we first found out that Fabulous was owned and run by Juwanda and Hanita Hassim, Shereen was very excited because she thought that they were just like Penny University, a Muslim-owned eating establishment that didn’t require a halal certificate. However, given our constantly changing culinary scene here in Singapore, she dropped them a message on Facebook and got a reply from Juwanda himself, saying that they did not own a halal certificate because they served alcohol but that all their meats are halal. When Shereen visited their website and read their about us section, she was won over and convinced that their food would be halal even if they served alcohol (just like the now non-existent Meatworks at ION or Al-hamra at Holland Village). Nonetheless, she was also very cautious with her ordering because she was still a little worried. Upon reaching Fabulous and glancing through the menu, she noticed that they served Beef Guinness Pie, which meant that not only did the cafe serve alcohol as a beverage but they also used it in their cooking, which made her a little queasy. So, given the circumstances and Shereen’s personal stand on this (keyword: personal), we decided to order blueberry pancakes, and Shereen was definitely sad that she couldn’t try the cakes. So to our fellow Muslim friends and readers, do check with them and perhaps, ask for special orders if you still want to dine there. It is by no means the establishment”s fault, of course, please don’t get us wrong. They definitely didn’t market themselves as a halal eating establishment so it is really up to each individual to decide whether they are comfortable dining there or not. In general, a quick glance at the menu would show you that they do not have any pork or bacon on the menu at all and all their meats are either beef, chicken or turkey meat. 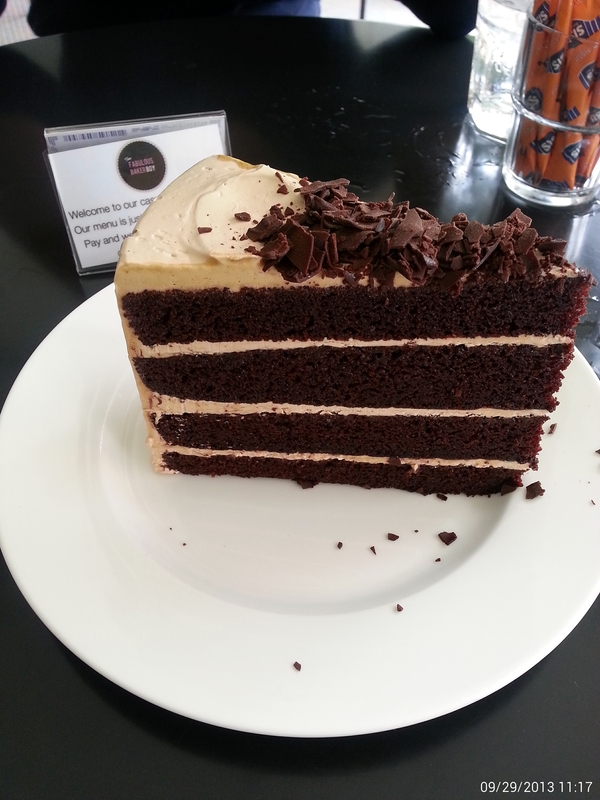 Other than this, I love the cake and I would have finished the entire slice if I weren’t full from my first breakfast. The blueberry pancakes were huge, and almost as wide as the plate. They are what good pancakes should be (yes, we are judging you, fast food restaurants). Fluffy and not too dense, crispy on the bottom, with the right amount of maple syrup drizzled on the, and the salted butter complimented the pancakes very well. 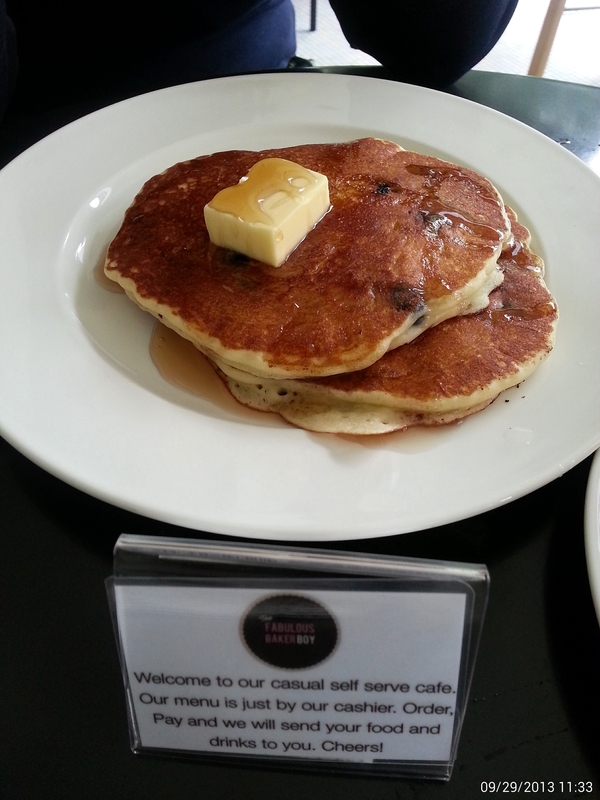 The slightly sour blueberries balanced the sweet and salted taste and we were truly satisfied by the pancakes. As for the coffee, my cappuccino was slightly disappointing. I thought it was slightly sour and I could detect a faint burnt taste. Otherwise, it was okay and I like that the foam was done nicely. (I hate lousy foams). Shereen’s latte was excellent, as evident in her reaction when she suddenly widened her eyes and went “Woahhhhhh it’s strong!” at her first sip. So you know what to order when you visit! On the whole, Fabulous is a great place. Very artsy, and a good hangout to chill and perhaps, get your creative juices flowing. The manager, Felix, makes it a point to interact with every diner and that is a truly great service. We had a little embarrassing episode with the latte. We thought they forgot our order, and they immediately made one for us. It was only later that we realised they didn’t charge us the latte in our original order. We contacted them via Facebook and went back to pay for our coffee. They were so nice about it and even offered to treat us to a beverage on our next visit: “Thank u…My guys said you just came to pay…See you again soon I will buy you a cup of bev. Thanks”. Once again, I am wowed by their service. I’ll definitely be back again, for the food and the people but Shereen says if she does accompany me back to Fabulous, she’ll be there for just their strong coffee. How to get there: Nearby MRT Stations: Dhoby Ghaut and Clarke Quay. Bus Services in the vicinity: 32, 54, 195, 530. Hi! 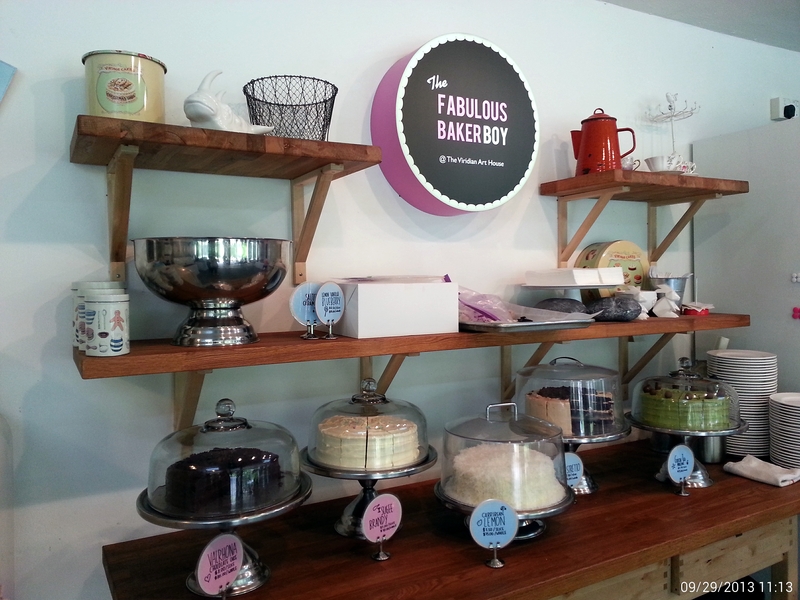 I love reading your blog and was pleasantly surprised that you wrote a review about The Fabulous Baker Boy. I’ve dined there a couple of weeks ago, so it’s interesting for me to read your post. Did the staff have long hair? I was served by a long-haired waitress who was affable and nice! We’re glad you enjoy our blog. And yes, the friendly staff has long hair. We’re glad you connected with us via our review. Do let us know what other places you want us to review and give us your feedback.